Before beginning this article, perhaps I should qualify myself to speak about the positive and negative symptoms of Schizophrenia. I have experienced both for the past 6 and a half years and while the positive symptoms have been under control mostly since being diagnosed with Schizoaffective Disorder by UCLA in 2008, I have still suffered from the negative symptoms. Post diagnosis I received my Masters Degree in Psychology and work as a marriage and family therapist intern at a non-profit and I plan to go on to earn my doctorate in Psychology with a research emphasis with my focus being on Schizophrenia, particularly the negative symptoms. 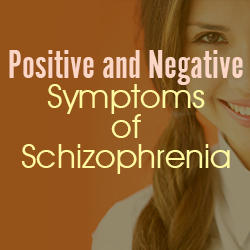 Positive symptoms of Schizophrenia are easily recognized and identified to provide the diagnosis. Hallucinations, delusions and intrusive thoughts are the most common symptoms of Schizophrenia and have a certain duration necessary to fit this disorder. Negative symptoms on the other hand are present but less dealt with when determining medication and research shows it can be just as debilitating as the positive symptoms. Blunted affect (a lack of emotional reactivity), emotional withdrawal, poor rapport, difficulty in abstract thinking, lack of spontaneity and flow of conversation and stereotyped thinking are all negative symptoms which present in each individual and also in men and women differently . Because the positive symptoms were so prominent (voices from God and the delusion I was very special), the negative symptoms were seldom discussed when being treated for Schizophrenia; rather, the question always was if I was hearing voices or delusional. I have been taking the antipsychotic Risperdal since being diagnosed but recently my psychiatrist added a the antipsychotic Latuda to my regimen which has greatly helped with the negative symptoms, especially emotional withdrawal. This has greatly diminished as I have actually been much more connected to friends and family because of the addition of the second antipsychotic. It helps that I work in a field where I study mental disorders, their symptoms, prognosis and treatment. I find it all very fascinating and love to discuss mental illness with all sorts of people I have met through my blog and through my work. I invite you to write to me and share your personal story or that of a loved one afflicted by this disorder or ask questions if one Is in the mental health field. I sometimes will feature it on my blog or one of my books I am writing, with permission naturally and no names unless requested. for 2 yr. the voices I heard barred me relentlessly. They commented she’s angry and other annoying things. They stopped about 4 mo. ago but I sense thier presence and still hear ever so quiet the voices. It’s like I’m under a microscope every waking moment observed. I feel as tho I’m worse since they got quieter. I’m having a hard time coping. I feel the experience traumatized me as if I wasn’t traumatized already! I lost faith in psyciatrists. I want to get off the medications. Nothing helps! I never talk about this to family or anyone. I isolate and would rather be dead than to be affected like this. The voices weren’t nice they were very mean and abusive. When somebody has schizophrenia, do they experience both negative and positive symptoms? Thanks. My father in law is currently in crisis. He hasn’t eaten in almost 7 days and wont drink, I think today is 3 days. We called 911. The sheriff came. He treated our family poorly and placated my father in law. Basically fed into the delusion. He called of the ambulance, our only hope to get him into the hospital. We have called crisis intervention and they told me may he has to give permission over the phone to be seen. A paranoid man who wont allow cell phones into the house is supposed to talk on the phone! The family services said that he has civil rights to not eat or to kill himself by starving. I read the laws for MN this is not the case… Our family is so frustrated and just plain worn out. We need immediate relief.